It's been more than a month since the Oregon hazelnut season wrapped up for the year and growers are still gathering together final numbers. Early figures indicate that this year's crop was significantly bigger than last year's hazelnut haul, putting it close to the record set back in 2001. Growers say ideal weather conditions and increased acreage helped the state to enjoy a strong year. 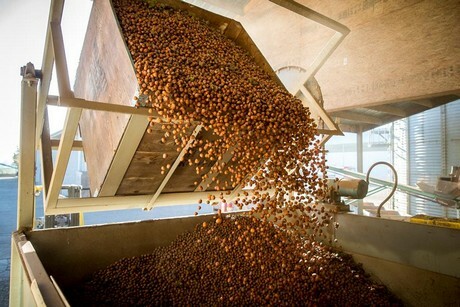 "The 2018 Oregon hazelnut harvest began in early September and finished in late October," shared Meredith Nagely of the Oregon Hazelnut Marketing Board. "Although final numbers from the 2018 harvest season will be available in early 2019, early reports indicate a yield of 46,000 to 48,000 tons, an increase of 44-50 percent over last year’s 32,000 tons. This harvest season was a great success thanks to perfect weather conditions, new acreage, dedicated farmers and the hazelnut industry work force." The vast majority of the hazelnuts grown in the United States are grown in Oregon and it appears that hazelnut growers are enjoying a good amount of success, with large increases in acreage being reported. With a large crop like this year's, the marketing arm of the industry is seeing good potential for promotions throughout the year. "Ninety-nine percent of U.S. hazelnuts are grown in Oregon across 72,000 acres," Nagely said. "Acreage has doubled in the past five years and continues to grow by 8,000 annually. With the larger crop comes more opportunities and the Oregon Hazelnut Marketing Board is working to broaden awareness and understanding of Oregon hazelnuts’ benefits and versatility while maintaining a premium price for its growers. This includes cultivating new demand in the foodservice, manufacturing, retail and consumer markets." Nagely added that hazelnuts have many commercial uses beyond the fresh nut market. "Hazelnuts, not just from Oregon, are being used by many of today’s most popular brands," she observed. "From hazelnut Oreos and M&Ms to RXBARs and lattes, brands are recognizing hazelnuts for their premium flavor. The future is bright for our industry." As part of the marketing efforts orchestrated for the Oregon hazelnut industry is the recent launch of their new website. According to Oregon Hazelnuts, the newly designed website is part of a campaign to increase domestic consumption. With the significant increase in acreage each year, it was thought that an improved source of information would be helpful. 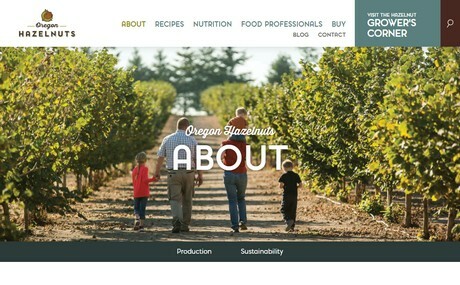 "Highlights of the new site include - A modern, user-friendly design that showcases beautiful orchard and culinary imagery, 18 new recipes starring hazelnuts including six from award-winning Oregon chefs, a new food professionals section to educate and inspire industry experts as well as updated nutrition information and interesting facts about Oregon’s hazelnut industry."